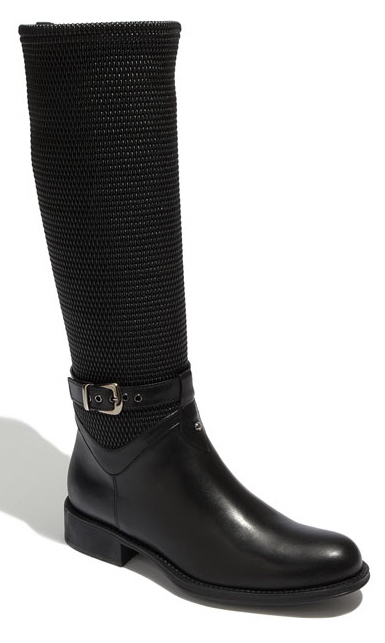 Let’s talk about boots, shall we? For starters, who are this season’s boots made for anyway? After a recent visit to Nordstrom, fueled by the rather incredible anniversary sale prices, I sat in the shoe department for nearly an hour trying on pair after pair. In every instance, the shaft was enormously wide and came up to mid-knee. The look was akin to a pair of trumpets on my legs, and tucking in skinny jeans did nothing to take up the slack. I was frustrated and disappointed, because the styles were quite wonderful. The sales associate who was helping me seemed as disillusioned as I was. It was clear that he had run into this problem before, and he wasn’t very happy about having dissatisfied customers walk away empty-handed. And that’s how I discovered these. I’ve owned Aquatalia boots in the past, so I know they tend to run a half size small. With this is mind, I ordered up and landed a perfect fit. The shaft doesn’t stick out from my leg, yet it expands to accommodate a pair of tucked-in jeans. They’re comfortable, waterproof, and stylish, and the woven design sets them apart from other equestrian boots on the market. They’re also made in Italy, which almost always works for me. Perhaps best of all, they’re on sale for 40 percent off. I’ll admit it. Shopping makes me feel good. I suppose, in a way, it’s my drug of choice–a reliable high that energizes my day, feeds my soul, and occasionally jeopardizes my bank account. Every now and then, a product comes along that not only dazzles me with its utter awesomeness but also with its philosophy. TOMS shoes are that kind of product. I just returned from Maiden Lane, a wonderful (and admittedly, my favorite) shop that has the distinction of being the official headquarters of TOMS shoes in Nevada County, California. 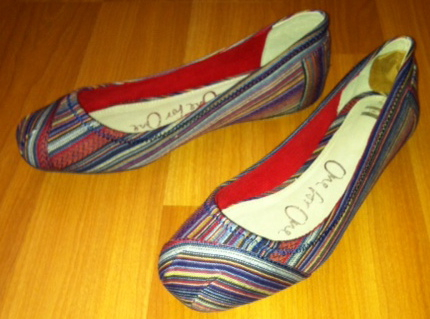 Resisting the urge to buy about three pairs, I settled on these ballet flats in a design called Jadon. 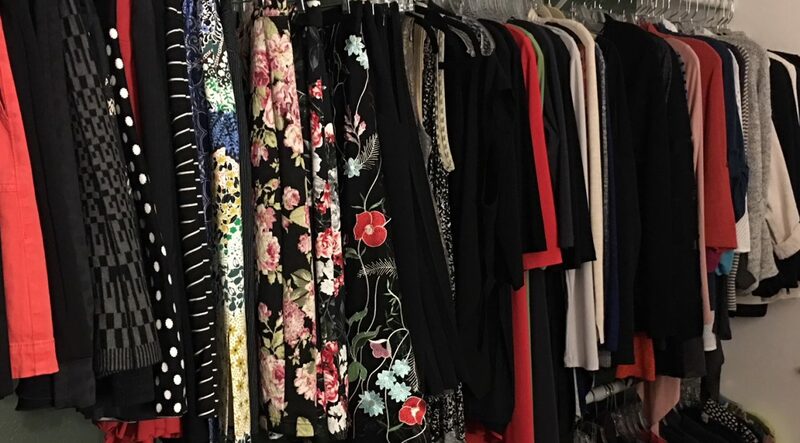 They are truly fabulous on so many levels–cute, comfortable, the perfect color pattern to team with denim–but let’s take a look at the more important picture. In 2006, when visiting Argentina, American traveler Blake Mycoskie discovered that many of the children had no shoes to protect their feet. 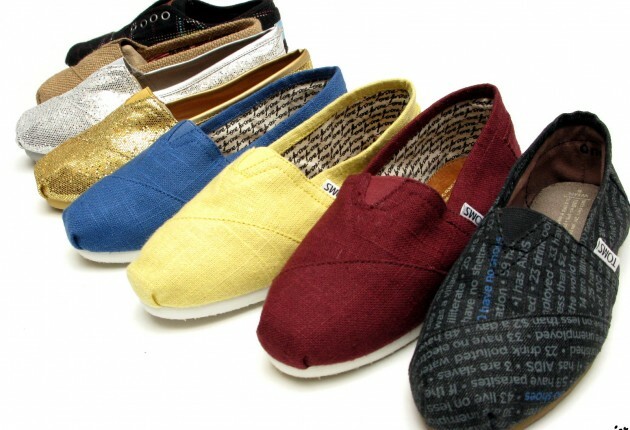 Wanting to help, he created TOMS Shoes, a company that embraces the philosophy of One for One. For every pair of shoes purchased, TOMS gives a pair of shoes to a child in need. Later that same year, Mycoskie returned to Argentina with a group of family, friends, and staff and gifted local children with 10,000 pairs of shoes made possible by TOMS customers. By September of 2010, the company had given more than one million pairs of new shoes to needy children around the world. In addition to aiding children in more than 40 countries worldwide, TOMS gives us, the shoppers, a free pass to indulge a bit, since our purchases have such a humanitarian upside. And since guilt and self-indulgence are often associated with shopping, it’s nice to know that the more we spend, the more we’re helping. …and the classic slip-ons. 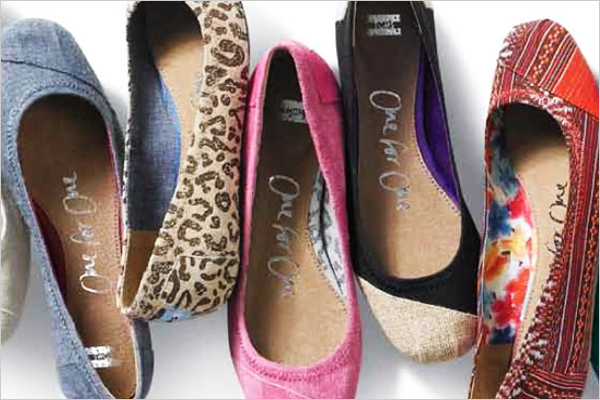 From canvas to patterns to sparkles, there’s definitely a pair for you.